Pin Up Girl Lip Balm is handcrafted from all natural bee’s wax and coconut oil. This lip balm is perfectly scented with essential oils and infused with vitamin E to keep lips soft and smooth. 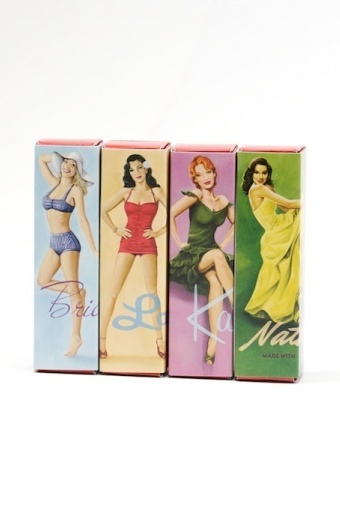 Pin Up Girl writes, "Much like actual Pin Up’s, our balm is naturally sassy and just as classy! So pucker up and enjoy!" So, meet Laura "Nifty Nutmeg Orange'', her lip balm is nutmeg orange flavored. And what impresses us the most is the cute little slide out box each lip balm comes in, making them the perfect gift! Ingredients: It's made of beeswax, coconut oil, lanolin, vitamin E (tocopherol), nutmeg, orange and peppermint essential oils.